"In part one of this series we introduced the topic of automated image tagging and showed how Cloud Vision APIs such as Clarifai can be used to classify images into different categories. We showed examples of SAGE images and the tags assigned by different Cloud Vision APIs, then discussed use cases for this innovative technology—primarily in discoverability and accessibility. 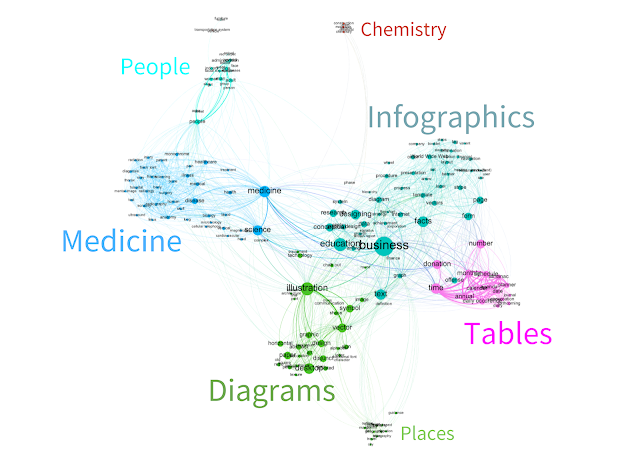 In this follow-on post, we focus on data analysis and specifically co-occurrence networks. By way of example we present a co-occurrence network derived from Clarifai image tags, which represents a kind of mental model of the SAGE journal images we processed. 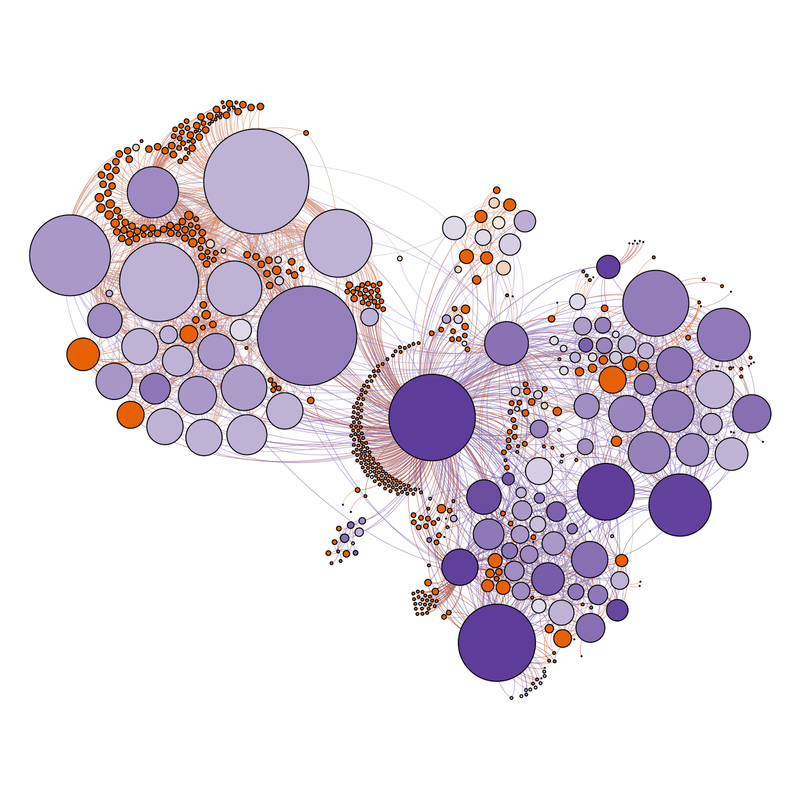 The following image is a visualization of the co-occurrence network that we created"
Introduction A couple of years ago, the publisher Springer Nature entered into a strategic relationship with Zapnito, an “Expert Network” platform. 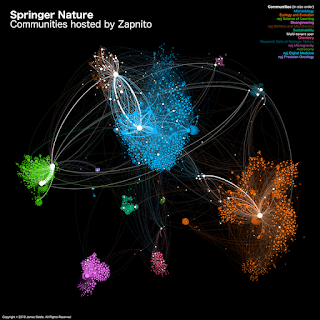 The goal was to facilitate knowledge sharing between employees, academic experts, and other interested parties, and there are now more than twenty different Springer Nature communities hosted on Zapnito, twelve of which are “Nature Research” communities and are the focus of this article. This network of communities represents an interesting opportunity to explore the relationships between expert communities, along with the way Zapnito is facilitating knowledge sharing. This blog post introduces the Springer Nature communities, then provides a light-touch exploration of community structure and connectivity, and its relationship to knowledge sharing and dissemination. The post is a result of a collaboration between Zapnito, Springer Nature, and myself, and is cross-posted on the Zapnito blog. The UK will shortly go to the polls for the 2015 General Election. However there's currently no clear front-runner, and in fact no clear coalition on the cards for a new government. The "new normal" of hung parliaments and coalition forming as part of UK politics appears to be here to stay. 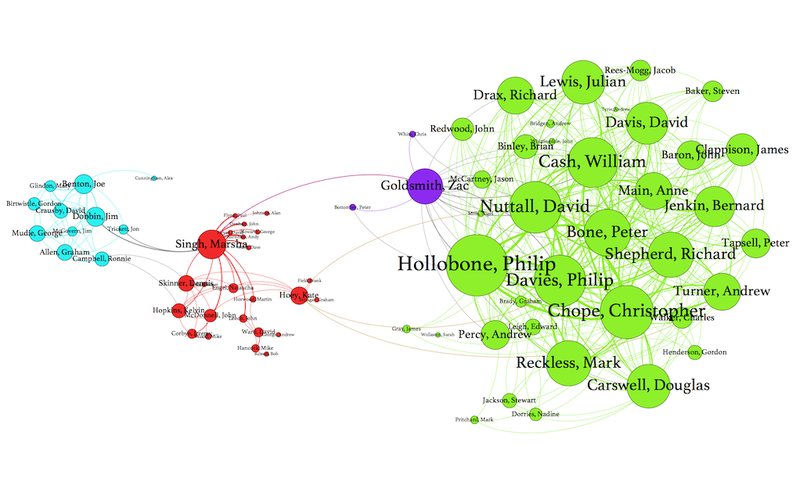 As such, I decided to take a look at the open dataset provided by The Public Whip project, with a view to visualizing the relationships between MPs (members of parliament) in the 2010 to 2015 UK government, using a tool called Gephi. The idea was to analyse how MPs are related through their voting patterns in the house of commons, and in particular how they are related through agreement or rebelliousness. Also I'll admit it: I wanted to write an article with "Rebel Alliance" in the title because I like Star Wars. Introduction: Why replicate SureChEMBL? SureChEMBL is a patent chemistry dataset and set of web services that provides a rich source of information to the drug discovery research community. It was previously owned, developed, and sold by Macmillan, but was recently handed over to the European Bioinformatics Institute (EMBL/EBI) and is now free for everyone to use. SureChEMBL can already be accessed online, so why would a locally hosted replica be needed? In this article, I take a high-level look Zapnito, a multi-tenant "Networked Knowledge" platform designed around small, expert communities. Zapnito is a knowledge sharing platform that allows organizations to create branded networks of experts. 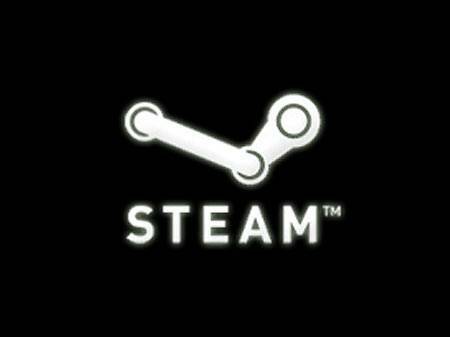 It's aimed at publishers, consultancies, media companies, and other corporations. Zapnito includes some social features (such as follow relationships, collaboration), but its focus is knowledge sharing rather than social networking. As the founder puts it: "Zapnito is a white label platform that offers knowledge network capabilities for publishers. We provide both highly private and open networks, and we own neither publisher content or associated data - both of these are retained by publishers." Every time someone in London makes a journey on a Boris Bike (officially, the Barclays Cycle Hire Scheme), the local government body Transport For London (TFL) record that journey. 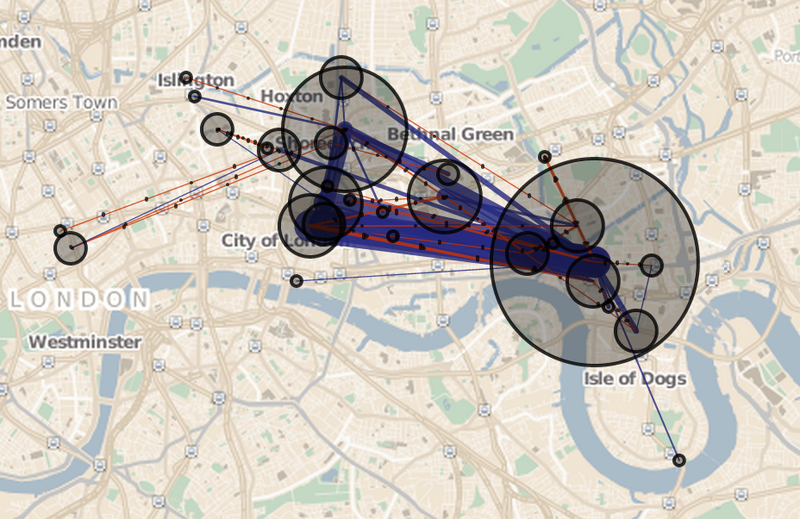 TFL make some of this data available for download, to allow further analysis and experimentation. 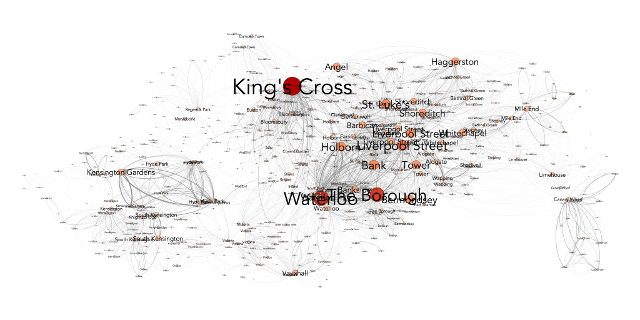 Below, you'll find maps of the most popular bike stations and routes in London, created from the TFL data using Gephi, plus a few simple data processing scripts that I threw together. The idea for these maps originated within a project group at a course on Data Visualisation, held at the Guardian last year. We're working on a more publisher friendly form, so thank you to my course mates for giving me the go ahead to include them here. First, here's a map showing all bike stations and all popular journeys.